race – Literacy Changes Everything! For the past few weeks, after my kids are in bed, I have had my nose buried in Ned and Constance Sublette’s quintessential soon-to-be-required-reading The American Slave Coast: A History of the Slave Breeding Industry. (My thoughts on this book will be a whole nother post…) Through reading this, I came to understand that few images exist of slave auction houses, and the historical remnants of slavery have been persistently concealed. While looking up sites to visit on a family vacation to Charleston, I came across The Old Slave Market Museum I was enthusiastic to visit this rare preservation of an auction building, but I hesitated because I would need to bring my three young daughters with me. I worried: Is it appropriate for them? Is it going to be too scary? But I really wanted to go. I really want my daughters to be educated about history and justice, even in a small way at their age. I want my daughters to see the joy I take in learning and the seriousness and purposefulness that I approach learning in my life. And so we went. It was $8 per adult and free for children, so I knew that even if we spent a short time, it would be fine – not too expensive. And so we went. My daughters love to look at maps, and we spent a little time discussing a map which showed how slaves were transported from Maryland and Virginia to other parts of the South – by chattel, train, river, and ocean. My daughters mentioned that the people in the photos looked sad, and they didn’t like that people had to leave their families. They asked me about the shackles and told me that they didn’t want to wear them. They studied a plaque that showed how people who were enslaved were prepared for the auctions – shaved, dressed nicely, being fed more food in the weeks prior to sale. I used some very simple questions (taken from Visual Thinking Strategies) to start discussions about the museum’s features: What’s going on in this picture? What more can we find? We spent twenty minutes in the museum, and I was proud that I took my children, proud that they behaved well, that they were curious, and proud that I overcame my hesitation of bringing them. After they went outside, I had the pleasure of speaking with History Interpreter Christine King Mitchell, who provided me with some wonderful booklists. She is working towards publication of a book of primary source materials, and she showed me a few copies of posters announcing slave auctions that will be included in her book. She is interested in race, so it is my responsibility now to find some books about this and start talking a bit about skin. I don’t feel comfortable with the topic at all, but I know it’s important. 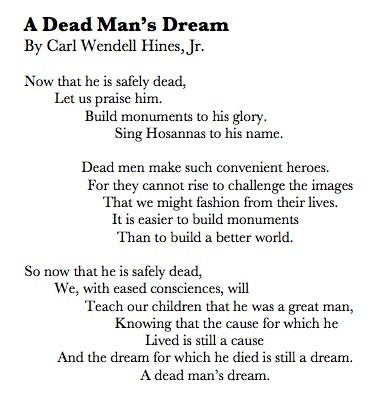 Although Hines wrote this 1971 poem about the memorialization of Dr. King, its message is tragically relevant 43 years later. Its second verse challenges the reader “to build a better world”. Teachers have the power to do just this through the life lessons they share in their classrooms. I would challenge every teacher returning to school this fall to unpack the events of Ferguson and related crimes against young people. For many of us, the scope and tragedy of Michael Brown’s death is overwhelming. We ask ourselves – How can I teach this the right way? As now-controversial illustrator Mary Engelbreit poignantly states: “No One Should Have to Teach There Children This in the USA.” However, while we adults have the privilege to see these events as news – something that sadly happened to someone else – our students, especially our young men of color, inevitably see themselves. As I myself watched these events unfold in the news, I could not help imagining if this happened to Quddus or Clayton. To avoid teaching this topic carries little consequences for the teacher – we will still receive our paychecks and most likely a good evaluation whether or not we address meaningful and relevant content in our classrooms. However, to find a way to unpack this for one’s students sends them a powerful message – I care about what matters to you, and I will guide you through this trauma. Even better, we can encourage our young people to problem solve alongside us about how to “build a better world”. I am convinced that ignoring and avoiding the events in Ferguson reinforces to students that school is, in fact, completely disassociated from reality. And this message is one that many of them know to be true already. I hope that you will find these resources useful for these difficult discussions. Despite the cynicism that social justice educators and leaders often face, I do believe that teachers and students hold the power to meet Hines’ challenge.